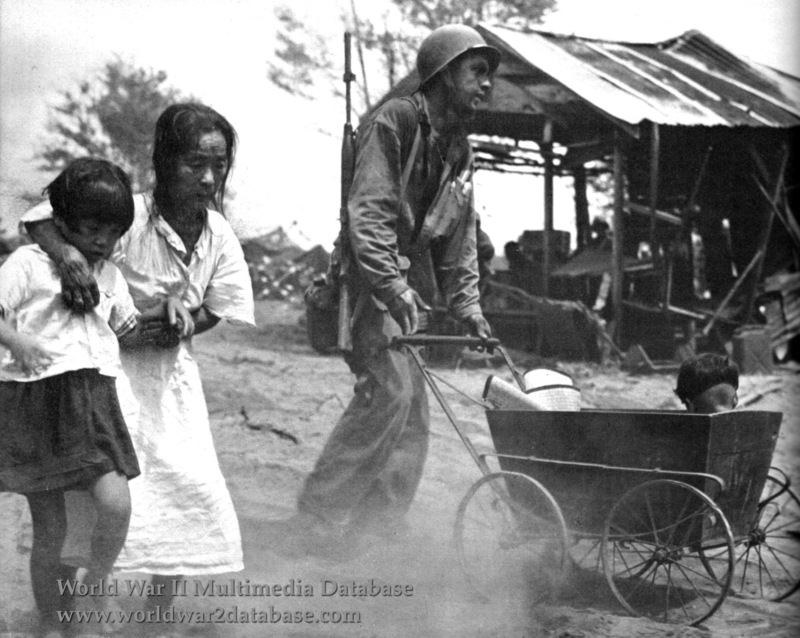 An American GI of the 27th Infantry Division assists a Japanese family with relocating to the civilian interment facility, Camp Susupe. The 30,000 Japanese, 2,000 Koreans, and 4,000 Chamorros (Marianas natives) on Saipan were a complex problem for Allied planners, who had never encountered large civilian populations in previous Pacific island campaigns. As the number of Japanese soldiers who surrendered was very low from 1942-1943, a US Marine language school was set up at the University of Boulder. The US Army attached Nisei (second generation Japanese-Americans) to their intelligence sections. These men, working with American soldiers reluctant to take prisoners in the face of numerous atrocities, were able to convince the civilians to surrender. Most Japanese were illiterate Okinawans who arrived to work in the sugar plantations and had little access to mass media; they were derided by the Imperial Japanese Army troops, a division exploited by American intelligence. Since many of the civilians wore military-style clothing, it was difficult to separate out the non-combatantants. Most of the male civilian population were forced into defense units and some participated in the last gyokusai suicide charge on July 7, 1944, armed only with bayonets on sticks. The mountainous terrain of Saipan allowed many soldiers and civilians to hide in caves supplied with food, livestock, and wild fruits, but little water. The American intelligence found offers of water highly successful, and many Japanese who surrendered were allowed to return to their comrades and bring them back to camp. Many civilians, highly indoctrinated with Japanese propaganda, killed themselves with grenades or by jumping off cliffs believing their fate would be worse than death if they surrendered. Most civilians who were killed died during the preinvasion bombardment or because they were hiding with military personnel. 22,000 civilians were killed on Saipan. Many American soldiers were deeply affected by the plight of the civilians and went to great risk to convince them to surrender. One soldier, USMC Private First Class Guy Gabaldon, convinced more than 1,000 people to surrender, winning the Navy Cross. Eventually 18,000 civilians (13,954 Japanese, 1,411 Koreans, 2,966 Chamorros and 1,025 Caroline Islanders) were housed at Camp Susape; they were encouraged to farm and were paid for working for the Americans. With a large number of children and a high birth rate, emergency supplies of baby bottles and diapers were flown out from the United States. After the war, the Japanese and Korean populations were repatriated.